This is a bit of a special page, as it does not concern a particular calculator or story about one. However, several calamities in the past few months, the last one just today, prompted me to start writing this page, in an attempt to prevent them from happening in the future. 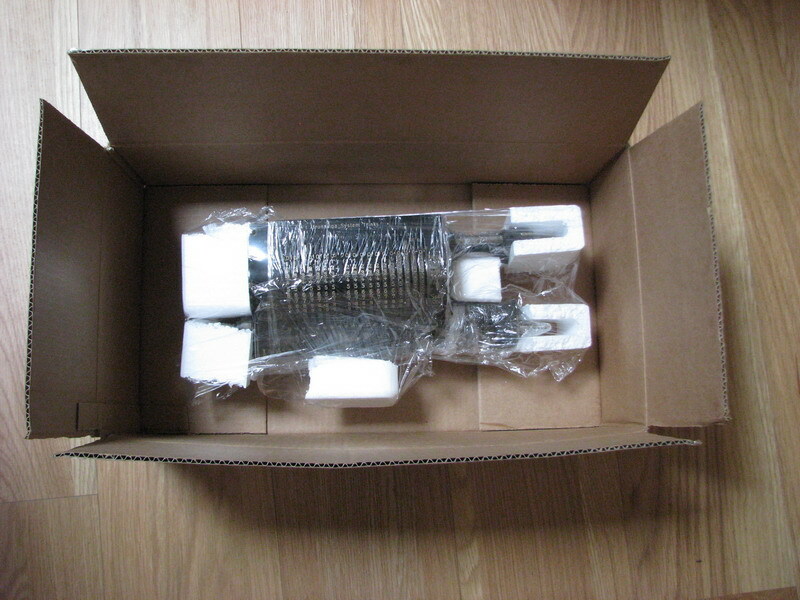 It is about packaging mechanical calculators to send them all over the world without any resulting damage to them. It is such an incredible shame for these beautiful machines, that have survived for decades, if not over a century, to be damaged by something as stupid as being packaged in the wrong way for shipping. Let's start with some basic physics, more specifically, Newton's first law - a body that is in motion wants to stay in motion unless it is acted upon by a force. A force is what results when a mass is accelerated or decelerated. Since calculators are heavy things, the forces that accompany a change in their speed, are also correspondingly large. This is easy to see - dropping a sandwich is not likely to damage the kitchen floor, dropping a sledgehammer, on the other hand, is. The problem is aggravated by calculators having lots of small bits that stick out - handles and levers of all kinds. If the large forces developed by decelerating a heavy calculator act on a very small surface, such as the end of a crank, the resulting stresses very easily can be so large that irreversible damage is done. The key point in packaging a calculator is to prevent forces acting on small surfaces - they need to be spread out. The only way to do this is to provide a sufficiently thick layer of somewhat compressible packing material between the surface of the machine and the outside of the box. I recommend 5cm of packing material on all sides of the machine. A three dimensional object has six sides - it doesn't help padding four of them, and leave the top and bottom unpadded, so please don't do that! Another recurring issue is that the 5 cm is not measured from the most outward point - if a carriage has a lever on it, and the lever can easily poke through the 5cm of padding provided to touch the end of the box, I don't even have to open it on arrival to know that I will find it broken. The key thing is "support everything" as much as "pack tightly", which means, fill ALL the space in the box not taken up already by calculator with packing material. What packing material you use is of little consequence - it can be styrofoam, styrofoam chips, polyurethane, tightly wadded newspaper, shredded cardboard, bubble wrap, ... as long as five cm of it is present on all sides of the machine. A special case is presented by machines which have their original baseplate and tin or wooden lid. Shipping these by closing the lid and stuffing the resulting box in packing material in a cardboard box almost guarantees that the machine will arrive broken. In postal handling, the top side of the box very seldomly stays the top side (conveyor belts, being thrown around, ...) no matter of how many urgent-looking stickers with "this side up" you put on it. The machine will find itself precariously supported on its edge or hanging upside down from the base plate supported by just two small bolts and washers, and as a result, when the box receives a shock or jolt, the baseplate will splinter, and the machine will roll around inside its own lid for the remainder of the journey and damage everything. The only way of properly shipping a calculator with a lid is to leave the lid separate from the baseplate, and stuff the space between the lid and the calculator tightly with sufficient packing material. Ideally, the calculator should also be unscrewed from the baseplate, to avoid all risk of damage. Now - to business - how do *I* package a calculator (and how would I recommend *you* to do it as well ?) First of all, shift the carriage into the position where the calculator occupies the least space. Some calculators have a provision for a bolt to be inserted to lock the carriage during shipping. This is probably a good idea, even though I have never found a calculator damaged from not doing this. The possible exception is a Millionnaire calculator - if you don't lock its carriage when shipping, things will end up arriving in pieces. A Millionnaire calculator carriage has the kind of weight and inertia usually only found in small neutron stars. Now, find a box which will allow at least 5cm of padding outside of the surface completely enveloping the calculator, cranks, levers and all. You need to be mostly concerned with length and width for now, depth will be another point of discussion further along. Next, I like to do two things - the first one is to wrap the calculator in cling wrap or a plastic bag. Why ? If you have ever had the misfortune of having to clean a calculator after it being shipped in pieces of polystyrene (as illustrated below), you will understand. If it is wrapped in plastic, all you have to do is brush the polystyrene off the cling wrap and unwrap the machine - hey, presto, clean! If at this stage you find yourself cling-wrapping a large pocket of air somwhere, stop! 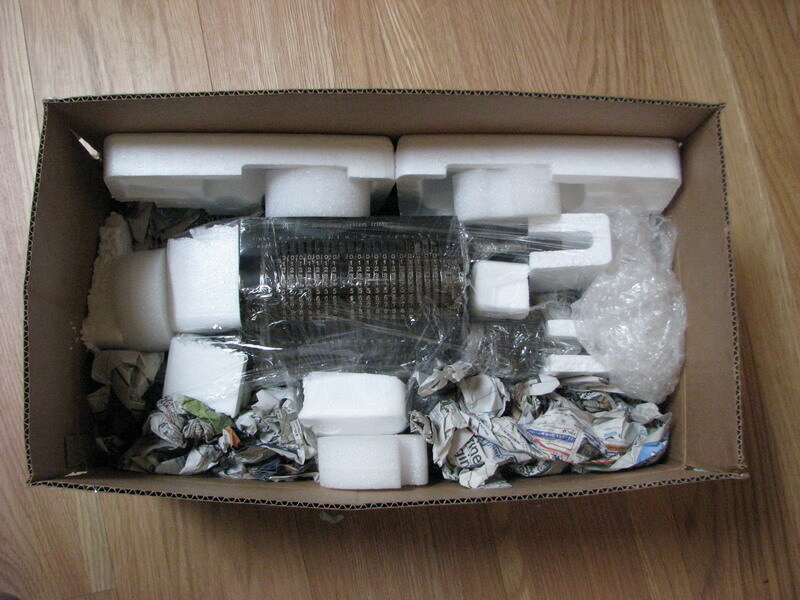 Fill it up with packing material instead (see e.g. 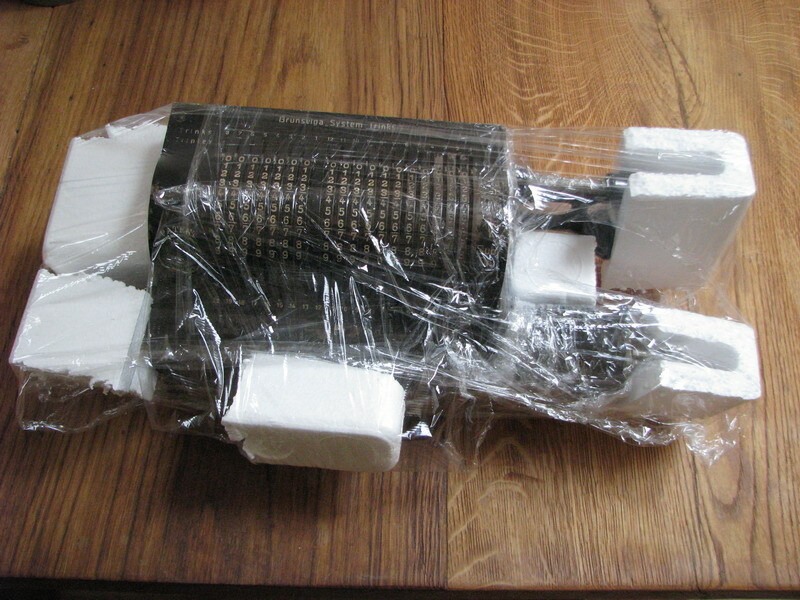 the block of polystyrene between the carriage and the crank handle in the picture below). The second thing is to protect all bits that stick out with extra blocks of polystyrene packing material and cling-wrap those in place too, as in the picture above. Then we test the box for fit. 5cm on all sides? Perfect! 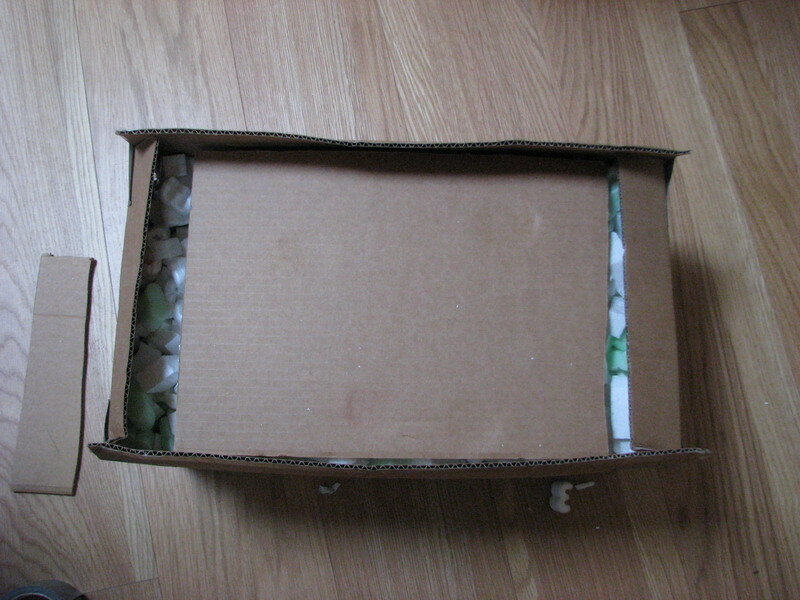 Take out the calculator and fill the box up with a bottom layer of 5cm of packing material. Put the calculator on top, and fill up the rest of the box with packing material as well. Get it in all the holes and compact it as well as you can. Tighter is better. If your box isn't high enough to get 5cm of packing material completely over the top of the machine, then tape some extra cardboard to the sides of the box. The only function of the box is to keep the packing material together - it may consist of as many pieces as you like, you can use parts of different boxes, or loose cardboard, it really doesn't matter. Once you filled the box to 5cm over the top of the calculator, push the packing material down with a large piece of cardboard on top. 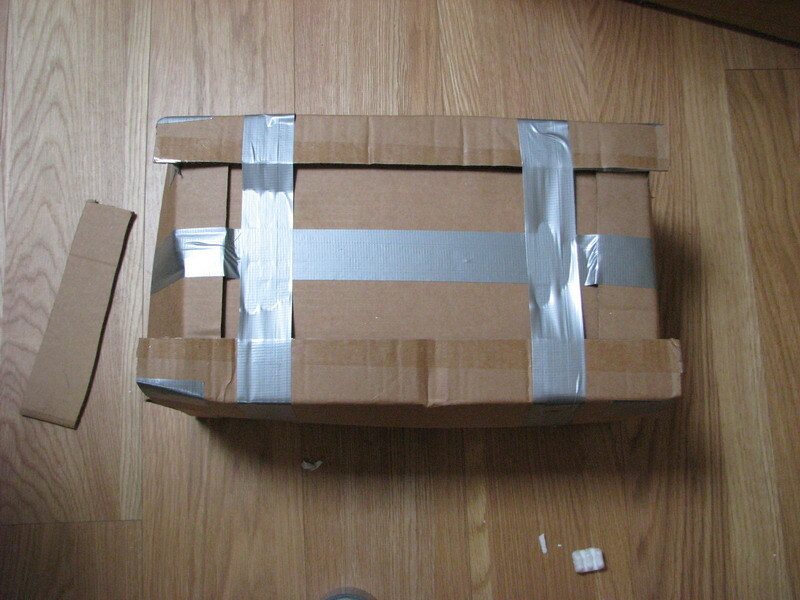 Tape this piece to the rest of the box on one side, push as hard as you can on the other side (use feet, knees, spouses, ...), and tape it there as well. Now wrap the entire box in tape - around the four sides, around the top and bottom and two of the sides, and around the top and bottom and the other two sides. And now comes the proof of the pudding - pick up the box, and shake it! If you can feel anything move inside (such as a calculator sloshing from left to right through the polystyrene chips), start over, it means there isn't enough packing material inside. If nothing moves inside, it means that the calculator is so tightly surrounded by packing material that no crank or lever can work its way to the sides of the box and get smashed by Postman Pat - which is exactly what we're trying to avoid here. Now you can move on to making a label - I prefer to write the address in very large block letters on a white piece of paper, put that in a clear plastic holder and tape the holder to the box on all four sides, ideally with tape that goes all around the circumference of the box. A package can't be delivered without a shipping label, and you wouldn't believe the things that have already happened to me with labels that fall off, or accidentally get stuck to another package - at least if the address is stencilled in large letters on the box, it cannot really get lost, if it ends up in the wrong place, the shipping company can at least find out where it should really go, even if the barcode or routing number is screwed up. Just for extra insurance, I write the address on two other sides of the box with a black marker as well (call me paranoid ...). For good measure I also add my own address (but clearly add "return to:", preferably in the local language of the country you're sending it to!) I like to write the return to address a lot smaller than the address it really has to go to. We don't want Postman Pat to get the wrong idea and accidentally send it back when it hasn't quite reached its destination yet - we want him to have to sit down and look very carefully to where it has to be returned if that time should come. Finally - insure your package. The insurance rates of the carriers themselves are outrageous. 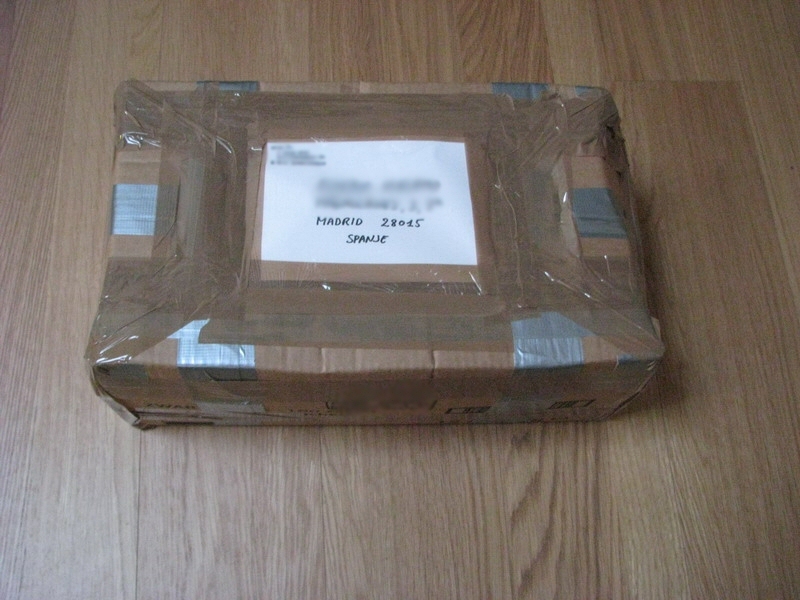 If you have to send a package across international borders (certainly when it has to go through customs) I find it much better to use third party insurance - there is no trace of it on the package so customs will be none the wiser (customs will often take the insurance value as the value they will tax, even if the item is worth significantly less than what you insured it for) whereas if a problem arises, you can soften the blow of the loss of a calculator by getting a substantial amount of insurance money back. Third party insurance can be arranged as soon as you have the tracking number, so I usually ask people who send me a calculator to send it uninsured but registered, and then buy my own insurance for what I think is a suitable amount. Do not get obsessed with the right sized box - assemble one from parts, the box really isn't that important, it's the padding! Make sure the address label can't fall off - put the address on three times!